As always you did a great job on this update. Amazing! Hmm... modfile size increated from 6.27mb to 6.97mb, so I think you have that part wrong. Ram usage might have increased, yes. I have a lot more happening in the background. Is it actually affecting gameplay? Why isn't my quiver pet working? I did put the feathers in the feed bag and the quiver is in my hotbar. It might be that I don't understand how the quiver pet works but if you could tell either why this isn't working, how to use it or both that would be great. Thanks! Is there a way to disable the sound they make when they eat from the feed bag (or add items to your inventory)? I looked in the config file, but I couldn't find an option for it. There should be a pet slot in the player's inventory. Inventory pets cannot do anything unless placed in this slot, and when in this slot, they will be activated and they are spawned as an entity right next to you. There is a visibility button on the slot, which allows you to see the pet or not. For pets like the apple pet, instead of being a direct item it will act like a sentry. It will roll around you (different animations for different pets, but rolling would fit the apple well) and follow you, and when a mob gets within a certain radius of you it will shoot apples at it until it either runs out of hunger or until the mob(s) die. If visibility is toggled, it will instead shoot apples directly from the player's chest instead. For pets that otherwise need to be activated like the Iron Golem pet, they will activate upon pressing a hotkey that can be changed via controls. All this would require is someone who can make good mob models, and then we will have a great pet mod! I would absolutely love to be able to have actual entities for pets. I feel like if they did that, they should make it in the config because some people like it the way it is now. I see a few pets listed in the config but there isn't any documentation on them. 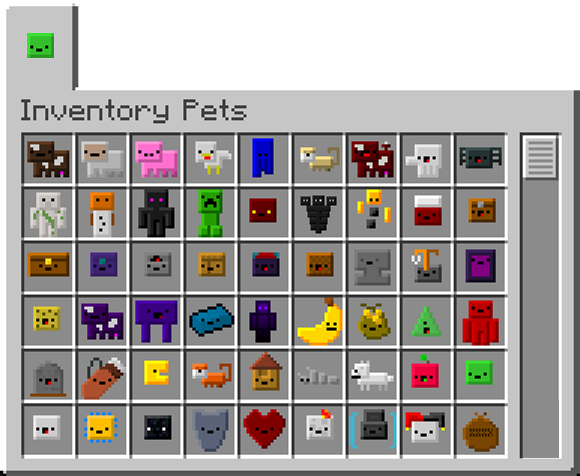 What do these pets do: Biome, Siamese, Saddle, Torch. I seem to be getting an error with flying not being enabled when walking on lava with the magma cube pet. Any suggestions besides the obvious enable flying? Was the pet Loot to blow the minerals? My modpack uses a custom launcher, which includes downloading all the mods jars from my file server. Is it okay If I include this? If you reply positive, I will add your mod to my modpack, where it will be featured and included in many YouTube videos from members of the series. This also means that said YouTubers will have obtained the mod from my file server and not this one, so your download count will not directly increase, and technically, if you used Minecraft's license, this would not be allowed. However, your license states "All Rights Reserved" prefixing your custom license, so I am asking for confirmation. If you reply negative, your mod stays the same, is not uploaded to my file server, and is not included in my modpack. Feel free to choose this one if you do not want more exposure or usage. If you do not reply, due to the vagueness of your license, I will use it in my modpack and add the mod to the official list. If you reply after I have added it, feel free to PM me, and if you want it to be removed from the modpack and included in no further videos, my PMs are open. A really fantastic mod! I‘m a big fan of you!You can see,I'm a Chinese boy with poor English.I had followed you for months.But It was a pity that I found Chinese language in this cute mod was incomplete. Only some of Pets' names are translated into Chinese,others like Holiday Pets and Pets' introduction or Achivement are not.So I tried translating them and I made it not so long ago.Then I wanna share my translation with you so that more Chinese guys can enjoy such a cute mod! By the way,it's the first time I have translated a mod that I'm a little nervous now.If there is any wrong in the translation Plz tell me at once!Thank you! I don't know how to upload a attachments.Would you mind telling me your e-mail plz? Great. Yes, that was really in need of an update. I will send you a DM. Thanks! Hey Purple,can you please make it so even if you're not a Patron and put on a Patreon Item in creative it doesn't create an infinite crash loop ? Is it still crashing in the latest version? If so can you link a log on pastebin or put it in Github? This is in a earlier version,that was my mistake for not saying what version. Normally I know better. Flying bug was removed on -items-, not mounts. Seems a new one sprung up from that fix on mounts. Don't feel bad, that tripped me up too. I have an idea for a new pet, behold the TNT pet! 2. (active) Throws a mini-TNT block which won't have as big of a blast radius as regular tnt, with maybe a 45 second cooldown. I hope you take this into consideration, as it would be really cool to see!